Bake from frozen, 220°C 3-5 minutes. 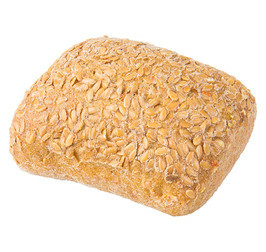 WHEATFLOUR ( contains ascorbic acid), whole WHEATFLOUR, water, carrot 11%, brown sugar, flaxseed, rapeseed oil, BARLEY malt, sea salt, dried WHEAT sourdough, yeast, WHEATGLUTEN, DURUMWHEATFLOUR, guar gum. May contains traces of milk, egg, sesame and lactose.